The question has been plaguing me for years… One Forever stamp or two? If you fold more than two letter-sized sheets of paper into a standard envelope with only one stamp, I’ve always felt that all bets are off. Three sheets… you’re pushing it. Four sheets… definitely not. But I’m not a human scale! How is a person really supposed to lift a letter, raise it up and down in the palm of your hand a few times and somehow figure out if it’s under one ounce? So inevitably I’d just throw on the extra stamp, just to be sure. 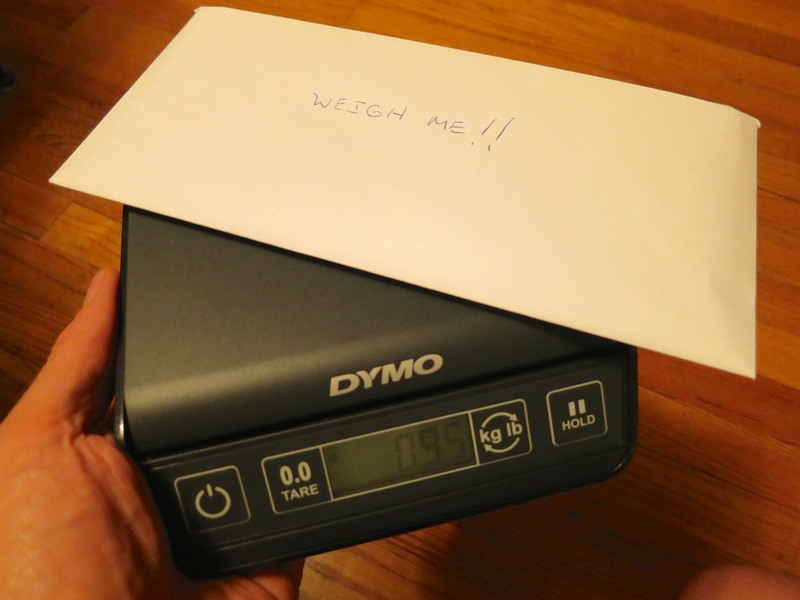 And what happens to your letter if it’s a smidgen over the weight limit? It’s supposed to get returned to you, right? The next day? The next week? The next month?! It’s like a kindergarten-style ‘time out’ for your letter. That’s a big-time punishment you really want to avoid! And it all feels like such a business model holdover from 1847 when U.S. postage stamps were first issued. Punishment for trying to mail an extra sheet of paper?! If you ask me, the United States Postal Service should come up with its own Amazon Prime-style shipping model, where you pay a fee to the government once a year to simplify your letters’ mailing costs. Wouldn’t that be so much easier? But for now, we’re on our own to find a solution. …can’t a little tech help us out here? Well, thankfully, I’ve already solved the conundrum of keeping up my stock of stamps at home. And granted, I know anyone can set themselves up as a mini personal post office, complete with postage printer and large scale. But I don’t need to start my own package delivery company… I just need a tiny scale to handle the occasional letter. 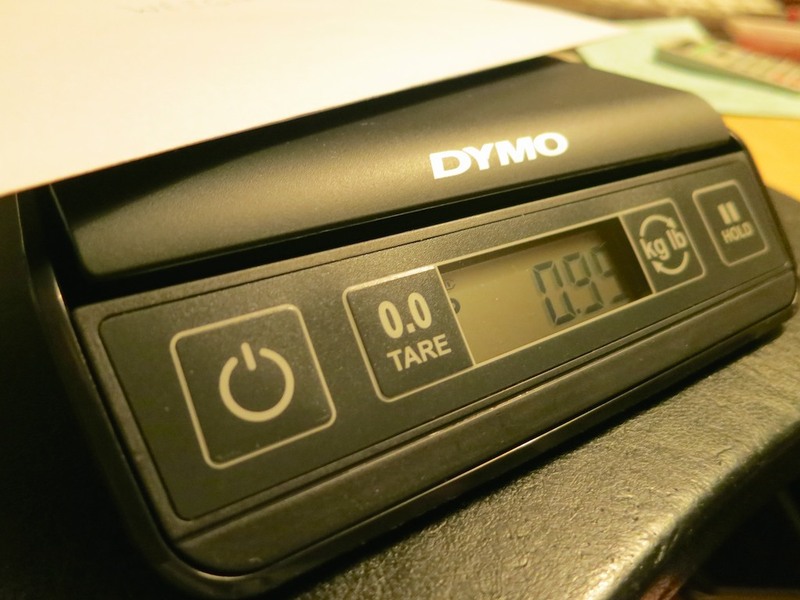 Sure… scales have been around for years…nothing cutting edge about that, but I only require a really small digital one. Something thin that can be stashed away like a book on a shelf. I took a look on Amazon, and of course, there’s a whole selection of postal scales waiting for you to click on them. The next question is price… Sure, the nagging ‘one or two stamp’ question can end up wasting a 49-cent Forever stamp every now and again. But is it really worth the cost of investing in your own scale? Well, the good news is you can get a small scale for under twenty bucks. I found this DYMO 3-pound Digital Postal Scale for $18.44. Its weight is just over a pound, with the svelte dimensions of 9” x 7.8”. Granted I don’t need it to weigh an object upwards of 3 pounds. At this footprint and price point, I think everyone should have a little scale at home. Why not?! How Many Sheets Can One Forever Stamp Handle? 3 sheets of 20 lb 8.5” x 11” paper weighed only .65 oz in a standard envelope and a Forever stamp. 4 sheets were .80 oz. Even 5 sheets made the 1 oz cutoff at only .95 oz. Who knew all of this can be handled by one Forever stamp?! Check It Off Your Bucket List? People have their own bucket lists. This really shouldn’t be on anyone’s. That said, there are those nagging day-to-day nuisances that can follow you around your entire life. They’re usually not important enough to spend the time fixing. But when you do, it actually feels unexpectedly sweet. Thank you for this! Mailing an 8 page letter to my dad and was wondering the same thing… one stamp, or two?? Going to go with two for sure on this one. Even when you ARE mailing something over 1 oz., why would you use *two* 0.49 “Forever” stamps? The second and additional ounces on a first-class letter cost less, and always have — currently only 0.21 for the second oz. or faction thereof. If going over only happens occasionally, then perhaps it’s not worth the trouble of getting a 0.21 stamp. If you do a lot of mailing of first class pieces over 1 oz., consider it. Moreover, USPS sells “forever” additional-ounce stamps.